From meek to mild all the way to downright dirty, the Low Drive is your go to pedal for classic bass overdrive tones. Most bass overdrives out there leave you lacking in TRUE low end response and definition but none of that nonsense here. The Low Drive gives you response like no other while also giving you clear and clean mid/high end definition. 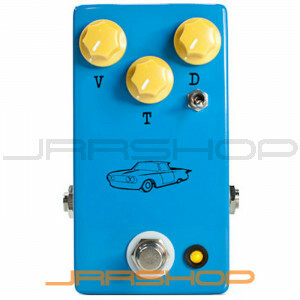 You will most likely find the tone knob to be the most useful overdrive tone knob you have ever used and the gain knob very flexible with an amazingly wide range of dirt. Another characteristic is that the clarity or your rig will be held in tact no matter how much drive you have going. The Low Drive will also run it at 18 volts for more headroom and punch... It makes a pretty slamming guitar overdrive as well! V2 has a 3 Way gain toggle that allows you to go from V1 clipping to open boost or LED crunch. Way more tones under the same hood!